Although there were no written records during prehistory, scientists have learned a great deal about prehistoric people. They have learned how early human beings lived and what important discoveries were made. Scientists also think they know why people moved out of Africa to other parts of the world. Africa. Then the earth’s climate changed—it became colder. Ocean water froze into huge glaciers that spread out from the North and South poles. As the ice sheets grew, the sea level fell and uncovered land that had been under water. Land bridges then connected Africa to both southern Europe and southwestern Asia. about 1.75 million and 700,000 years ago, people made their way into Europe and Asia. Much later, between about 40,000 and 15,000 years ago, they also migrated to the Americas. Scientists call the first age in which people lived the Paleolithic (pa le uh lith’ ik) Age, or Old Stone Age. It lasted from about 2.3 million years ago until 10,000 years ago. During this period, people obtained their food by hunting and gathering. Paleolithic people lived in small bands, or groups, of about 30 members. When the food supply was good, the bands grew to about 40 or 50 members. Most of the group members lived to be no more than 20 or 25 years old. More than half of the children died from illnesses or were killed by animals before their first birthdays. The people within a group lived and worked together and shared their food. They fed and cared for people who became injured or sick. GROUP LIFE - Experts believe that most early people lived in groups made up of several families. Here, a group of hunters use stones to sharpen tools. Two men carry a large animal killed in a hunt, as a few women tend fires near their tents. Each band searched for food within an area known as its home territory. This usually covered about two square miles, or five square kilometers, for every band member. There were campsites at various places throughout the home territory. The band stayed at a campsite until the available food supply was used up and then moved. get honey and into the ground to dig roots. Men of the group obtained meat. They caught fish using their bare hands and hunted small animals with sticks and stones. Occasionally, they were able to kill a large animal that was too young, too old, or too badly hurt to run away. A good kill meant that the group would have enough meat to last for several days. Life for hunters and gatherers became easier when they learned to make tools. At first the only tools people had were sticks and stones they found on the ground. Soon they learned to shape stones to make them more useful. EARLY TOOLS - For more than 2 million years, prehistoric people lived by hunting animals and gathering plants. They used tools made of wood and stone. The wooden tools have decayed. Archaeologists, however, have found many stone tools. Among the earliest shaped stones are the Olduvan pebble tools, named after the Olduvai Gorge in eastern Africa where they were first discovered. Pebble tools were made from pebbles or stones about the size of a fist. The toolmaker hit one pebble with another, removing chips and creating a jagged cutting edge. This edge was sharp enough to cut the meat off of small animals’ bones, split animal bones, and chop up plants. Later people learned to knock long, sharp-edged chips, called flakes, from stones and use them as tools. Using flakes for knives, they could butcher, or cut up, animals as big as elephants quickly and efficiently. People also used flakes to scrape one end of a wooden branch into a sharp point for a digging stick or a meat skewer. People also learned to make fire during the Paleolithic Age. The first fires they knew about were made by nature, such as those started by lightning. Eventually, people discovered how to make fire themselves. They created sparks by rubbing two sticks or stones together, or rapidly turning a stick in a hole in a dry log. People used fire to keep themselves warm and dry. They also used it as a weapon, throwing burning sticks of wood at animals to drive them away. Sometimes they used fire to drive big animals into mudholes. The heavy animals would sink in the mud and people could then kill them. easier to chew and digest than raw food. As a result, people spent less time eating and more time doing other things. Early people usually camped out in the open. They protected themselves from the wind by digging pits in the ground or by crouching in dry river beds. They also took shelter under an overhanging rock or piled up brush. 100,000 years ago, however, people in China, western Europe, and southwestern Asia were living in caves most of the time. After hunters began killing large animals, they found that the animal skins could be used for protection and warmth. They scraped the skins clean and then laid them out in the sun to dry. Later, people discovered that pounding fat into the skin while it was drying would make it softer. big difference in where people lived. Before they had clothing, most people stayed in areas that were warm and dry. Once they had clothing to protect them from the weather, they were able to move into areas that were cooler and wetter. In addition to learning to make tools, fire, and clothing, early people developed language. Before they learned to talk, early people simply made sounds or pointed to objects to express meaning. Hand signals were probably used for common things such as water, food, animals, and weapons. Gradually, because of new social needs, sounds and hand signals were no longer enough. The development of language was a great human achievement. It made it possible for people to work together, share ideas, and pass on their beliefs and stories. The younger generations could learn more easily from older generations, and greater progress was made in all areas of civilization. Germany, where their remains were first discovered in 1856. Since then, other Neanderthal remains have been found throughout Europe and in parts of Asia and Africa. Scientists estimate that about 1 million Neanderthals were living at any one time. Neanderthal people were good hunters. They used traps to catch birds and small animals. They used pitfalls to catch large animals like the rhinoceros and the elephant. A pitfall was a large hole that was covered with branches, leaves, and earth. As an animal ran across this hole, it crashed through the covering and fell into the pit. The hunters would then kill the animal with spears. Neanderthals were also builders. In northern areas, for example, they made houses by covering a framework of mammoth bones with animal skins. More bones piled on the bottoms of the skins prevented them from being blown away. As many as 30 people lived in such a house during the cold months of the year. They improved cave dwellings by digging drainage ditches in caves and designing rock protection for entrances. people from this time in which they discovered the remains of flowers, tools, and food. 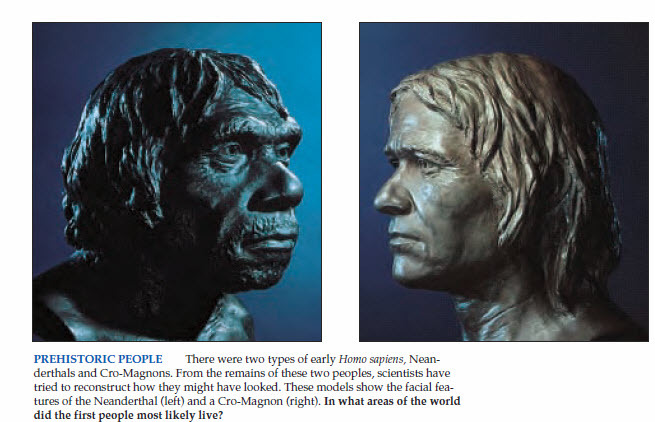 The second kind of Homo sapiens is the Cro-Magnon (kro mag’ nahn), named after a rock shelter in France where their remains were first discovered in 1868. Cro-Magnons appeared in North Africa, Asia, and Europe about 100,000 years ago. Archaeologists consider them the first modern human beings. could make other tools and objects from antler, bone, ivory, and shell, as well as stone and wood. the end of wooden sticks could penetrate the hides of larger animals. People fashioned antler and bone into spear throwers, or devices that made spears fly through the air faster and farther. This allowed hunters to stay a greater distance from animals, making hunting less dangerous. PREHISTORIC HORSE - This prehistoric painting of a horse was found on the wall of a cave in Lascaux, France. Early art such as this always showed the animal’s profile. or ocean currents then carried the rafts to other lands. It is likely that this is how people reached Australia about 40,000 years ago. clothing with bone or ivory beads. They played music on flutes carved from long, hollow bones. Cro-Magnons were artists as well as toolmakers. They carved statues out of ivory and bone or molded them out of clay. the animal. 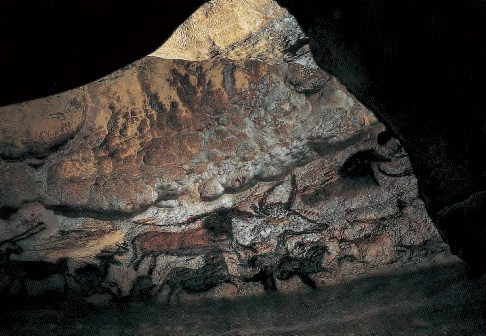 Anthropologists think the cave paintings may have been a kind of textbook about Cro-Magnon ceremonies, traditions, or history. Cro-Magnon bands cooperated, often hunting large animals together. This required them to jointly agree on rules and the first true leaders. Every year or so, they held social gatherings where they exchanged information about the movement of animal herds. They also traded materials such as amber and shells. In the Neolithic (ne uh lith’ ik), or New Stone Age, about 8000 B.C., people changed from food gatherers to food producers. Over several thousand years they began to obtain most of their food from farming. This brought about such great changes in the way they lived that experts call the beginning of farming the Neolithic Revolution. other was learning to herd animals. Experts believe that people discovered that seed from wild grains, such as wheat and barley, could be planted and harvested. This probably came about when they noticed that new shoots had grown from spilled grain. Scientists believe agriculture developed independently in different parts of the world. In southwestern Asia, early people grew wheat and barley, and in eastern Asia, they grew millet, rice, and soy beans. In Mexico, they grew corn, squash, and potatoes, and they grew peanuts and a grain called sorghum in Africa. had chased into a ravine. The hunters killed one animal at a time, saving the rest for later. Soon captured animals began to lose their fear of people and became domesticated, or tamed, and the hunters became herders. In time, Neolithic people were breeding animals to improve the animals’ qualities. People also began using certain animals such as donkeys, camels, and llamas as pack animals. people, began to grow. Experts think there were about 5 million people in the world in 8000 B.C. Within 4,000 years the population grew to about 90 million. People were also living longer. and formed villages of about 150 to 200 people in areas with a good soil and water supply. POTTERY MAKING - Neolithic people learned the art of baking clay pottery. Baked clay, unlike sun-dried clay, will not disintegrate in water. 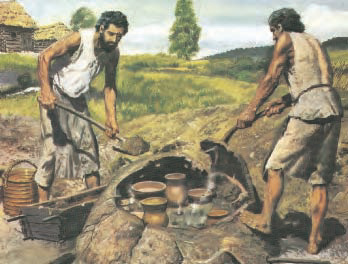 In this picture, men are covering the oven so that the pots inside will bake. The earliest known villages in the world have been found in southwestern Asia. One of the oldest is Jericho (jer´ uh ko¯) in the West Bank between Israel and Jordan. It dates back to about 8000 B.C. Another is Abu Hureyra (ah bu hu ra´ rah) in Syria, which was founded about 500 years later. A third early village is Catal Hüyük (kat’ uhl hu´ yuk) located in Turkey. People lived there from about 6500 to 5700 B.C. important contribution to architecture because it enabled buildings to support weight above an open space. houses through a hole in the roof by using a ladder. The houses were crowded together on the side of a hill. The floors were covered with rushes, or grasslike plants, and sleeping platforms were covered with mats. EARLY VILLAGES - Archaeologists today continue to dig up artifacts of early people. These scientists have uncovered the sites of several ancient villages. apple orchards, fields of grain, and pastures where sheep and cattle grazed. A result of increased food supplies was specialization, or the development of occupations. Fewer people were needed to produce food so they began to do jobs that had nothing to do with food. They became potters, weavers, and metal workers. They exchanged the things they made for grain, fruit, and meat. used pottery for carrying, cooking, and storing food. This enabled them to add such things as soups and stews to their diet. In addition, people learned to weave cloth. People took wool from sheep, spun it into thread, and wove the thread into cloth on a loom, which was invented during the Neolithic Age. They dyed the cloth bright colors and used it for clothing. on the ground and hammered these metals into beads and jewelry. Soon they learned how to shape the metal into weapons. 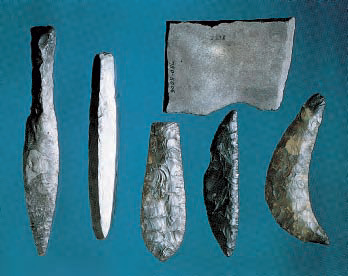 Because metals found on the ground were scarce, however, people continued to work mostly in stone, bone, and wood. earlier times due to land ownership. People’s lives depended on the use of a given piece of land. As a result, people began to protect what they had. They set boundaries and passed their land on to their children. Even so, disputes often arose over land ownership. To keep order in Neolithic villages, a single chief was chosen. Besides settling disputes, the chief, with the help of a small group of people, directed village activities. Experts believe that the chiefs of most Neolithic villages were also priests. They handled religious duties for the village which included offering prayers for things people needed, such as rich soil, healthy animals, and water for crops. At first, Neolithic people prayed to the forces of nature that they saw around them. After a time, they created gods and goddesses to represent these forces. The most important was the Earth Mother, the goddess of fertility. Many of the houses in Catal Hüyük, for example, had altars for this goddess. 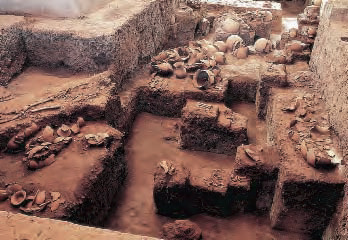 Archaeologists believe that more elaborate religious customs and ceremonies appeared at this time. Neolithic people began to build separate altars and other places of worship for their many gods and goddesses. 1. Prehistoric time can be divided into the Paleolithic and Neolithic Ages. 2. 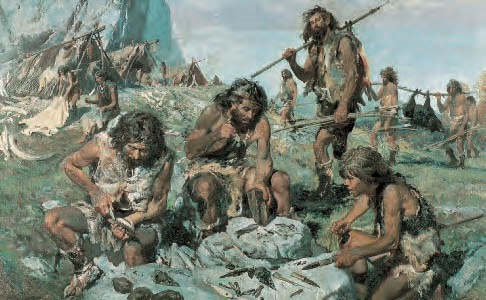 During the Paleolithic Age, people lived in small hunting-and-food-gathering bands. 3. Over time, Paleolithic people learned to make tools and clothes, developed language, and discovered how to make fire. 4. Early Homo sapiens included the Neanderthal and the Cro-Magnon. 5. The shift from food gathering to food producing brought so many changes that it has been called the Neolithic Revolution. 6. Food production made it possible for people to settle in one place. 7. Increased food supplies in the Neolithic Age resulted in increased population and specialization. 8. Neolithic villagers learned to make pottery, weave on looms, and work with metals. 9. Neolithic village government was led by a chief who settled disputes and directed village activities.